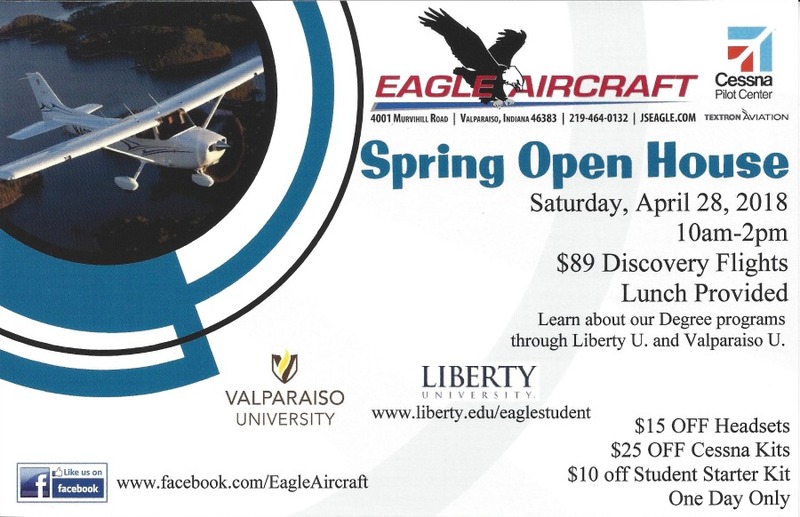 Spring Open House – Learn to Fly Now! Eagle Aircraft is one of only a few Part 141 flight schools in the State of Indiana. Eagle Aircraft can now offer an FAA approved shortened combined Private/Instrument course, Commercial and Multi Engine Courses under Part 141 training requirements. We will continue to offer FAA part 61 training as well as offering Part 141 approved courses. Completing your training at an FAA approved Part 141 flight school is a big advantage for career flight students. By following a structured training program, you can earn your ratings with lower minimum required flight times which translates into money savings for the student. Eagle Aircraft has approval from the IN Department of Veterans Affairs to accept the GI BILL benefits for Instrument Rating, Commercial Rating, CFI/CFII and ATP Ground Course. If you think you qualify for benefits under the new Post 911 law that went into effect on October 1, 2011 give us a call or go to http://www.gibill.va.gov/ to see if you qualify. We have been accepted as an affiliate of Liberty University in Lynchburg Virginia. *For more information contact Eagle Aircraft at (219) 464-0132. Join Eagle Aircraft’s Pilot Club to save money on aircraft rental rates. Join today for $200 and a low monthly fee of $45. Club members receive a special aircraft rental rate, use of the Chart Library (excluding local charts), BFR Currency at no cost (2 hrs. instruction annually), No Early Out/Late in Fees, as well as many other benefits. Call 219-464-0132 today to join and save on rental rates. Contact us below for more info! Eagle Aircraft offers a comprehensive flight training program from obtaining your Private through ATP flight training ratings. Our staff of professional flight instructors has earned a reputation that brings individuals from all over the world just to attend our flight school for their training. 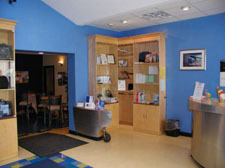 Eagle Aircraft is a Cessna Pilot Center. The Cessna program is the only integrated flight-training program in existence - flight and ground school lessons are designed by educational experts to work together for maximum retention. 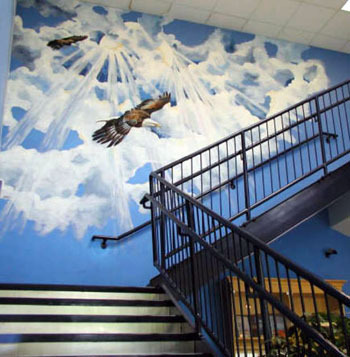 Eagle Aircraft is one of only three FAA Part 141 flight schools in the state of Indiana. We are also approved for VA benefits and SEVIS approved for International students. We welcome international students who want to come to the United States to train and will issue an I-20 to students who need an M-1 visa to begin flight training at our facility. Affordable housing will be arranged for our students. Contact Eagle Aircraft at 219-464-0132 or send an email to oms@jseagle.com for more information about our international student program. "You've always dreamed of soaring the skies. . . Stop dreaming and start flying today!" CALL (219) 464-0132 TO SCHEDULE YOUR FIRST FLIGHT LESSON TODAY !